Joel Osteen, bestselling motivational author and evangelical pastor of America's fastest-growing megachurch, was among a small group that included Mormon Sen. Mike Lee, to meet privately with Pope Francis at the Vatican in Rome, this week. Osteen said he was honored to meet with Pope Francis, who leads the world's 1.2 billion Roman Catholics. 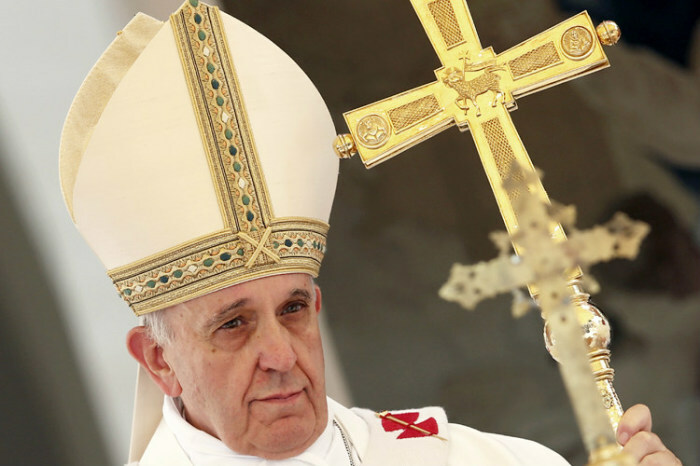 "I like the fact that this pope is trying to make the church larger, not smaller. He's not pushing people out but making the church more inclusive. That resonated with me," Osteen told the Houston Chronicle. The megachurch pastor, who ministers to 52,000 worshippers weekly and reaches millions through his books and television broadcasts, added that the group's meeting with Francis was cut short due to the death of a cardinal, Simon Lourdusamy. Osteen added, however, that the pope asked the group to pray for peace in the Middle East as well as for him. According to Deseret News, the meeting with Pope Francis on Thursday was "part of a multiday, unofficial visit to Italy to promote ecumenical prayer and interfaith understanding." In addition to Sen. Lee's and Osteen's presence, the publication reports that others in attendance included Tim Timmons, a pastor and author based in Newport Beach, Calif., and Gayle D. Beebe, president of Westmont College in Santa Barbara, Calif. The Fellowship, or The International Foundation, reportedly organized the trip. The Fellowship is led by evangelical Christian minister Douglas Coe, who was noted by the Vatican Information Services as one of many guests received by Pope Francis on Thursday, cited simply as: "Doug Coe of the National Prayer Breakfast, U.S.A., and entourage." The Fellowship is the main organizer behind the annual National Prayer Breakfast held in Washington, D.C.
Beebe, president of the interdenominational Christian liberal arts school Westmont College, was included in the party meeting the pope as a representative of "Christian higher education in the ecumenical conversation." According to Westmont College, Francis had invited more than a dozen "North American Protestant leaders" to discuss the question: "Can we find common ground in order to advance the life and ministry of Jesus so more people can experience the joy of Christian faith?" The ecumenical meeting was a part of Pope Francis' on-going efforts to bring unity among Christians, previously stating in public remarks, "Divisions among us, but also divisions among the communities: evangelical Christians, orthodox Christians, Catholic Christians, but why divided? We must try to bring about unity." He added, "Seek unity, unity builds the Church and comes from Jesus Christ. He sends us the Holy Spirit to build unity!" However, Pope Francis's call for unity goes beyond the Christian community. During his recent visit to the Middle East, Francis invited Israeli Jewish and Muslim leaders to join him in prayer for peace for their region at the Vatican this Sunday. Israel's Chief of State Shimon Peres and Palestinian President Abu Mazen will be joined by a delegation of rabbis, Islamic imams, and Israeli Druze community leaders, according to news reports.